One of the best parts of the infectious disease outbreak movie Contagion was the decision to include an antivaccinationist, conspiracy-minded, alternative health advocate, played by Jude Law. Law gave a character-perfect performance of someone intent on deliberately and selfishly thwarting public health advice, putting lives at risk as a consequence. Sadly, the writers didn’t have to look far for real world examples: It’s hard to forget “Health Ranger” Mike Adams’s paranoid music video produced in 2009, at the height of H1N1, when he decided to put every antivaccine argument into one performance. When a theory has been confirmed so completely by facts as has the proposition that vaccination effectually performed will prevent an individual from contracting small-pox, or at least so fundamentally modify the disease that it is no longer a serious malady, there is in many minds a natural distaste to fight the battle again or to be constantly defending the position against the attacks of ill-informed or prejudiced persons. But this battle is still being fought, after over 100 years of immunization, and over two dozen diseases becoming vaccine-preventable. The anti-vaccine movement is a real movement, and it’s doing what it can to create fear, uncertainty and doubt regarding public health messaging. There is evidence that antivaccinationists can influence vaccination decisions. The arrival of social media over the past decade means there’s the need for public health advocates to adapt their messaging to this new medium. What seems clear is that “traditional” public health tactics, with warnings and arguments from authority, are dwindling in their effectiveness. All aspects of medicine are moving towards models of shared decision-making. This is an overdue change, and it’s been facilitated by the widespread availability of health information. Information is no longer hidden from public access. Want the approved product monograph for a vaccine? It’s available online. Even the primary literature is becoming more freely accessible. Unfortunately, the power of the Web 2.0 and social media has made it easier for antivaccinationists to foster antivaccine fears and sentiment. In order to combat this misinformation, the movement’s tactics and tropes must be understood, so they can be called out. Skewering the science of vaccine safety and efficacy, while trying to create legitimacy for unfounded or discredited theories of harm. Antivaccine advocates denigrate legitimate scientific studies, and the scientific process in general, why also trying to bolster scientific credibility for their own theories. Pseudoscientific conferences, like those offered by AutismOne, give the veneer of legitimacy to disproven beliefs. Shifting the hypotheses and the villain, from MMR, to thimerosal, to other “toxins”, and more recently, “too many, too soon”. Censoring criticism, whether it’s at Age of Autism, Mothering.com, or other antivaccine sites that delete comments or restrict access to their events, creating virtual or real echo chambers. Attacking the opposition, whether it’s David Gorski at Science-Based Medicine or lawsuits against physician Paul Offit or journalist Amy Wallace. Tropes are language or literary devices that are intended to achieve a specific effect. Not quite a a cliché, they’re recurring themes that, in the context of the anti-vaccination movement, are used to create fear, uncertainty and doubt about vaccines. Kata’s paper included 14 tropes – I estimate there are at least 30, if not more. Recognizing antivaccine tropes is a key skill in countering antivaccine propaganda. 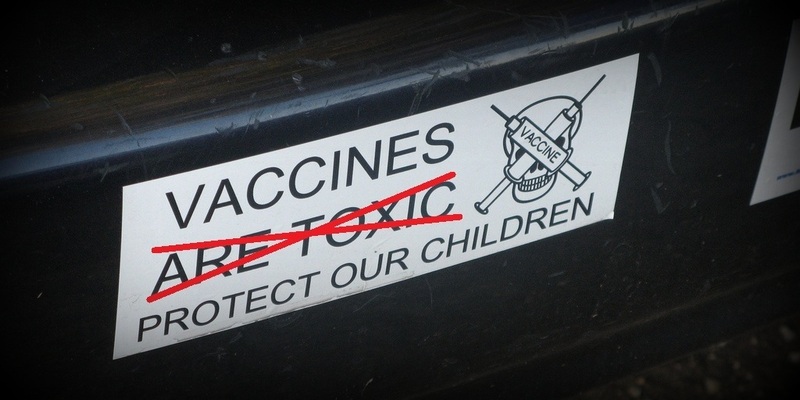 Antivaccine advocates are reluctant to admit that they fundamentally oppose vaccination. So a common tactic is denying the opposition of vaccines, but instead arguing that one is in favour of safer vaccines. This trope, when taken literally, is hard to argue with – who could be against products that are safer? This is a straw man argument. No public health advocate argues against safe vaccines. Yet 100% safety in anything is impossible to guarantee. Vaccines have risks and benefits, with the benefits dramatically outweighing the risks. But to antivaccinationists, “evidence” is listed to imply that vaccines could be easily made safer – if only manufacturers would listen! But looking more closely at the arguments reveals misleading information and distorted representations of scientific information. Antivaccinationists cannot or will not understand that “the dose makes the poison”. Instead they link the consequences of exposure to vaccine ingredients at other settings and doses, declaring vaccines to be unsafe in he process. The goalposts keep moving with this trope: The toxin used to be thimerosal. Now that thimerosal has been removed from almost all vaccines, and the incidence of autism hasn’t changed, other ingredients are blamed. Whether it’s formaldehyde, squalene, aluminum, or some other component, the scientific evidence doesn’t stop claims like, “FDA Approved H1N1 Vaccines Contain Ingredients Known to Cause Cancer and Death!” This argument is just a distraction from the main issue of the antivaccinationist: The vaccine itself. It’s always the vaccine. One particularly misleading tactic used by antivaccinationists to emphasize vaccine toxicity are “vaccine calculators” that are crafted to frighten you into avoiding vaccinations. If a vaccine cannot be shown to be 100% safe, it is suspect, according to this trope. Another straw man argument, it ignores any meaningful evaluation of risk and benefit. It further ignores the fact that no health care professional denies that vaccines are not risk free. However, they are much safer than the diseases from which they are designed to protect. While few doubt the benefit that seatbelts offer, the fact that they do not prevent deaths under all circumstances is usually not cited as reason to avoid using them. In fact, it’s because of the actual evaluation of risk and benefit that some vaccines are not appropriate for some individuals under some circumstances. Rather than use science-based information, NVIC’s Physician’s Warranty of Vaccine Safety is a tool created by antivaccinationists for parents to give to their physician. With a combination of misleading and demonstrably incorrect statements, no physician is likely to sign the document, providing the impression that vaccines are unsafe. Antivaccinationists will also point to adverse event surveillance systems and the Vaccine Injury Compensation Program as evidence of the harms of vaccines, again ignoring any serious evaluation of benefit and risk. There is truth to the statement that it is impossible to completely prove a negative hypothesis. However, when huge epidemiological studies fail to detect any causal relationship, it’s reasonable, based on the evidence, to conclude that no relationship exists. Multiple lines of evidence support this conclusion. The burden of proof is now on the group making the association – and no credible scientific evidence exists to support that hypothesis. In fact, epidemiological evidence suggests that vaccination is very safe – one of the safest health interventions we make. This is a frequent and deceptive tactic, suggesting that sanitation and other public health measures can protect against disease adequately, and therefore the vaccine isn’t responsible for the decrease in the incidence of a disease. While it’s true that sanitary measures are essential components to preventing the spread of some diseases (e.g., influenza), it glosses over the scientific evidence demonstrating that most spread regardless of hygiene. Varicella would continue to infect up to 90% of the population by age 12 if it were not for vaccines. Graphs which are purported to demonstrate a lack of vaccine efficacy are drawn to be deliberately misleading. A popular argument from alternative practitioners like homeopaths, chiropractors, and naturopaths, this trope is the naturalistic fallacy: Natural is good. Vaccines are unnatural, and therefore bad. Immunity conferred by (surviving a) disease is perceived to be superior and desirable to vaccination. This has led, unbelievably, to events like pox parties where infectious material is shared.The argument is an odd one in that vaccines induce an immune response, so that it’s the body’s own “natural” immunity which is then primed to identify and fight any future pathogen exposure. The naturalistic argument is among the weakest arguments: Deadly nightshade, botulism, and smallpox are all natural. But most people, if given the choice, would prefer to avoid them. Jenny McCarthy sees the resurgence of communicable disease as an acceptable consequence of her anti-vaccination drive. She rejects any responsibility from stoking anti-vaccine fears, when it’s clear that to McCarthy and other anti-vaccine advocates, no vaccine is safe enough to administer. Yet if there is no credible evidence linking vaccines to autism (as is the case) then there is no “choice” that needs to be made between the DPT vaccine and autism. Rather, the decision to take the vaccine should be based on an evaluation of the benefits and known risks – which is overwhelmingly positive for vaccines. Galileo Galilei was persecuted by the church, for ideas which contradicted church dogma – not scientific evidence. Galileo was an educated scientist and astronomer, not a critic armed with the 16th century equivalent of degree from Google U. There is no necessary link between being perceived as wrong, and actually being correct. Given the infinite number of incorrect statements for every established fact, the idea that an idea is being criticized for not being correct means it is more likely that idea is incorrect, rather than correct. Perhaps not surprisingly, the stridently antivaccine organization Age of Autism has a Galileo Award. Its 2008 winner? Andrew Wakefield. “Falsus in uno, falsus in omnibus” – “False in one thing, false in all”. This argument is referred to as the thalidomide gambit (aka Gavura’s law), or the Vioxx gambit. The fact that science can be “wrong” in this way is a feature, not a bug, as one of the differences between science and pseudoscience is that science is self-correcting whereas pseudoscience continues to put forth the same debunked points over and over again. These pseudoscientists present “science” as a monolithic entity with no difference between different types of science and the uncertainties associated with each field. This is a simple argument from popularity, sometimes called an appeal to a widespread belief or an appeal to common practice. When a statement is prefaced with “Everybody knows,” you’re looking at an argument from popularity. Science is not a popularity contest, and popularity does not indicate the validity of an idea. Rather, ideas must be evaluated based on their own merits, and the scientific evidence that support them. This argument is regularly used to defend practices which are popular but not supported by any scientific evidence, like homeopathy, integrative medicine, and also antivaccinationism. The argument from popularity is also the basis for different antivaccine petitions. Unfortunately for the antivaccine movement,, what is accepted science is not determined by vote. Illustrated nicely by Mike Adams the “Health Ranger”, and neatly rebutted by Steven Novella, these are arguments of the antivaccinationists’ own creation which appear everywhere on antivaccination websites. By creating false arguments, antivaccinationists use this tactic to avoid providing credible scientific arguments to support their own positions. Any critic of the anti-vaccine movement will inevitably be called a shill for Big Pharma. It’s probably the most common ad hominem attack use by antivaccinationists, accusing public health supporters of being supported (financially or otherwise) by pharmaceutical companies. This accusation shifts the discussion to one where the public health advocate must act defensively regarding their motives, freeing the antivaccinationist from actually responding to the scientific evidence. It’s been used to attempt to deliberately poison the reputations of public health advocates such as David Gorski, Paul Offit, and others. But whether or not someone actually is being supported by a pharmaceutical company has no relationship to the scientific evidence. Antivaccinationists, lacking credible evidence to support their position, use ad hominems like the pharma shill gambit to avoid responding meaningfully to the scientific evidence. Strength of the association: How strong is the association between cause and effect? Consistency of the association: Do other studies support the same association? What about a control group? Specificity: Does altering only the cause alter the effect? Temporal relationship: Does the cause precede the effect? Biological gradient: Is there a dose-response relationship? Biological plausibility: Does it make sense? Does it violate well established scientific evidence? Coherence: Does the evidence fit with what is known of the natural history of the disease? Experimental evidence: Are there any clinical studies supporting the association? Reasoning by analogy: Is the observed association supported by similar associations? In the case of vaccine-related harms like vaccines and autism, no causal relationship exists. This argument is used to denigrate scientific evidence and genuine knowledge about vaccine safety, arguing that relevant expertise is inappropriate or unnecessary. A postmodern argument, it redefines expertise in ways that may be empowering, or at least offer more flexibility to the anti-vaccine argument. In some ways this argument can also illustrate the Dunning-Kruger effect, a cognitive bias where those with little education on a topic actually rate their own understanding of the evidence higher than average. This comes across clearly in antivaccination arguments, where advocates project absolute certainty in their beliefs. Public health advocates and vaccine supporters, who understand the data and the evidence, may in fact seem more tentative, given the imperative to be accurate in their responses. This argument also seems to be used by alternative health providers (e.g., homeopaths, naturopaths, and chiropractors) with antivaccine roots that may not promote science-based perspectives on vaccines. There are at least 14 antivaccine tropes which continue to be used in antivaccine arguments. More likely exist, but this covers the most common ones encountered. One of the most effective ways to combat antivaccinationism is to identify and to call out tropes when you see them. Don’t debate them: Pseudoscience and logical fallacies are not a serious argument against the established scientific evidence. That evidence is clear: There is no credible evidence to suggest vaccines cause autism, or that the risks of vaccines outweigh the benefits of vaccination in most circumstances. Antivaccinationists have been dodging the facts, and offering tropes instead of evidence to support their arguments for over 100 years. It’s time to stop this threat to public health. Photo from flickr user captaincinema, adapted for use under a CC licence. This is a great post, Scott, revealing a great deal of work. I hope it gets wide play. Nice one ! Thank You. How do you counter the experience argument? Lets say someone has three kids. The first two were fully vaccinated and the 3rd child had no vaccinations. The oldest Child has Autism, the middle child has ADD and frequent bouts with fevers and Ear infections, while the third child Is in Ideal health. The third child hardly ever get’s so much as a cold, and when she does It’s over at a far more rapid pace than the other two children suffering from the same cold. The Parents are of course convinced that not vaccinating their third child was the right action, and they wish they had done the same with their first two children. In what way, if any can the concerns of these people be addressed? Countering such anecdotal evidence or bias is tricky, since nothing one can say to the parent of a child with autism which is blamed on vaccines will ever change their mind. Counter examples of vaxed kids who are perfectly well, or even studies on vaxed vs unvaxed kids and incidence of infections (usually fewer in the vaxed kids) will not be persuasive to an individual who has already made up their mind. I guess they will now have to add another trope to the list – the “Math Fail”. From one of millions who take an immune suppressing drug for a serious medical condition, PLEASE get your vaccines for the sake of others. You have made a very SELFISH decision, and most people have not seen what whooping cough, lockjaw, polia etc. can do to people (especially children). These vaccines are truly a miracle of modern medicine. I applaud pediatricians who refuse to treat families who are unvaccinated. That’s actually quite a selfish request. Very strong article. A lot of intelligent work has been put in. In the same time I can find a flow in every paragraph: constant pointing to a proper scientific study sounds very glamorous and proper. Nonetheless it remains possible that some 10-20 years later true science WILL establish a link between autoimmune diseases and intensified vax schedule. If this happens (this possibility you cannot currently exclude) by that time we will end up with severely damaged population. True science is good, but it does not prevent REAL LIFE events, it can merely analyze them and draw conclusions. But there are real people out there whose life are affected right today – they have little consolence from the fact that science can self-correct the course decades later. None of you ever lived in society where every 88 person is autistic. This is the stats from 2012. Once there parents are dead or not looking after them – society will have to. Once again if current studies do not demonstrate a link, does not mean that link does not exist. It would be wise not to subject the all Earth’s newborns to something that has not been proven safe. Author, I believe that watching your child or grandchild having seizures after injection will immediately persuade you to look at the issue from other side. Somehow it remind me a story how “mild CAMEL’s are for your throat”. This were testimonies from doctors to the public. Yet it took some 40 years for the scientific community find a link cancer-smoking. I dont think those who are now dying of cancer are helped by the fact. This is a great post, very comprehensive. Thanks for the extensive research you put in to this. Is there any chance t translate this ( with full credit) and publish it in our Turkish Skeptic blog?